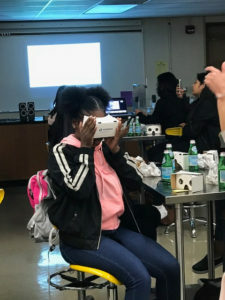 We had an amazing virtual reality workshop facilitated by enthusiastic volunteers from The Hydrous (https://www.thehydro.us/) and Facebook. Erika Woolsey, The Hydrous CEO and Co-Founder led the workshop. Jim Chowdry from The Hydrous and Monica Ares from Facebook helped facilitate the event. There were 37 extraordinary girls who attended the event. It started with a delicious lunch from VeganBurg. Thank you to Erika Woolsey from The Hydrous for feeding the girls such a delicious, healthy meal. After the presentations, the girls got to experience virtual reality by something they use everyday, their phone! They created VR landscapes using their phones and looked at them 360 and using the Cardboard VR sets. They used the app to experience Augmented Reality and Virtual Reality. All the girls had a chance to use an actual Oculus Go! Thank you Erika for doing a great job in leading the workshop. Thank you also to Jim and Monica for helping out. Then a panel of women talked about their careers and stories. It was an extraordinary day and the girls left knowing they could do any career they set their minds to and saw the possibilities made real. Thank you Erika and Monica for sharing your stories with the girls. These stories help girls connect with STEM and be inspired to sign up for the Academy of Engineering. Thank you to Amber Zertuche, the IGNITE Regional Director, for coordinating the event and making sure everything went well. Thank you for your steady and unwavering commitment to move IGNITE forward. After attending the event, 67% of the girls became more interested in a technical or engineering degree or career.